When it comes to politics, I guess I could be considered an idealist. When I read about politics and our elected officials at whatever level (local, state, federal), I am always disappointed by the lack of intelligent discussion and respect from both the Democrats and the Republicans. Since I’ve been on Twitter, I have been dumbfounded by the childish Tweets from both parties. Politics should not be about fighting the other party, as Speaker John Boehner alluded to when he said, “We’ll live to fight another day.” (As quoted in Senate approves deal to end shutdown, raise debt ceiling) If you see governing as a fight, where does that leave compromise and cooperation? Last January I wrote a piece about the lack of civility in politics, and while I knew the theatrics and vitriol would continue from both parties, I never thought it would lead me to leave the Democratic Party. If you’ve read my previous pieces, you know that I fall on the Left of the political spectrum. The past year, I tried getting involved in my county Democratic Party and even attended the 2013 Democratic Party of Wisconsin convention. On Twitter I’ve tweeted in support of liberal values and questioned the decisions made by Gov. Scott Walker and Sen. Ron Johnson. My patience with the Party grew thin, however, as they began to shove Mary Burke down our throats. According to Matthew DeFour of the Capital Times, Mike Tate, the chairman of the Wisconsin Democratic Party, “dubbed Burke the instant frontrunner in the race.” Should other Democratic politicians around the state take this as a snub? Burke declared her candidacy on October 6, and yet as of today (October 16) her campaign website still does not have any information on where she stands on issues. Can we conclude that the Democratic Party is just picking candidates now because they have millions of dollars? What happened to primaries? “Fighting Bob” La Follette, the man who fought for primaries and open government, would be sickened by the state of progressive politics in Wisconsin. I know I am. 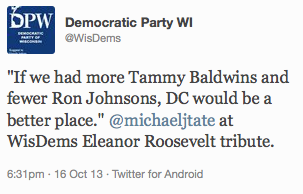 Mike Tate and the Wisconsin Democratic Party weren’t done, however, with their amateurish approach to politics. Take, for example, this tweet. Really? We should have representatives from just one party with similar ideas in Congress? Is that Tate’s vision of democracy? The fun doesn’t end there, though, as the Party came up with yet another lowbrow attack on Gov. Walker. This time they created a fake campaign bumper sticker for him. The last straw for me, however, came today as the Senate agreed on a deal to end the partial federal government shutdown and raise the debt ceiling. As it became clear that the Democrats would emerge as the “victors,” the Democratic Congressional Campaign Committee decided to start #GOPplaylist on Twitter, asking followers for songs whose titles would “humiliate” the GOP (example: “End of the Road” by Boyz II Men). In other words, the Democrats resorted to gloating and poor sportsmanship, actions we teach our children not to do. That was when I decided that this would be my last day as a member of the Democratic Party. So now I am a man without a Party. I don’t know if I want to support or join another one. I enjoy staying current with political news, but I am not sure I want to be involved in politics. Does this make me apolitical? Am I just overreacting and being completely unrealistic? Is there a third party out there that supports progressive/liberal values but does not resort to absolutes and child-like behavior (name-calling, bullying, gloating, etc.)? Perhaps that could be the topic for future posts- my quest to find a third party in Wisconsin. **Update, October 17, 2013: I realize that the Republicans are just as immature as the Democrats and would have celebrated had they been the “victors”; however, I focused on the Democrats because they are the party with which I affiliated. I hold with Russ Feingold… until there are better campaign finance laws, we are doomed. Sigh.